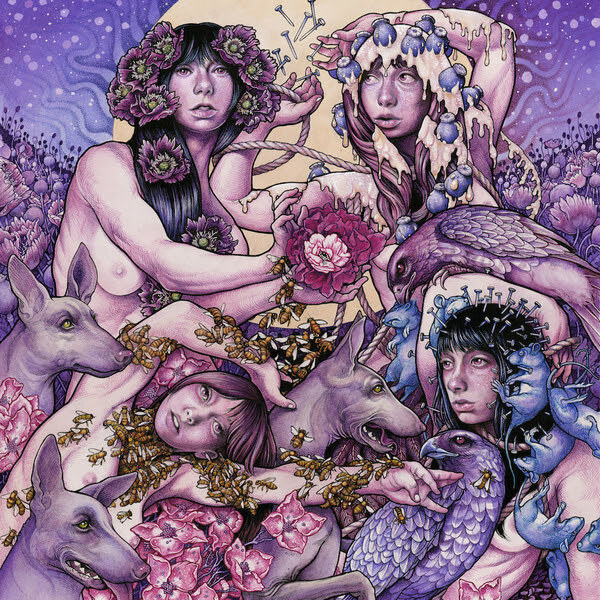 Baroness reveal the cover for the band’s fourth album, Purple(Dec. 18, Abraxan Hymns), via a time lapse video that shows John Baizley’s process for creating the album artwork. This clip follows fans piecing together quadrants of the album cover that were revealed via t-shirts shipped last week as part of the band’s deluxe album pre-order bundles. Baizley has done the artwork for all of Baroness’ releases as well as fine art and album art for bands including Skeletonwitch, Black Tusk, Kvelertak and Kylesa. A gallery can be seen atwww.aperfectmonster.com. The latest video is part of a series of clips the band is sharing with fans, documenting the making of Purple, from line-up changes, to recording and now artwork. The most recent clip focused on the guitar work for the 10-song album arrived via Guitar World (http://bit.ly/1RYWm38) and all four already released videos as well as the video for “Chlorine & Wine” (https://youtu.be/DnYO7iQfQDQ), are viewable via YouTube (www.youtube.com/baronessmusic). Baroness will head out on a series of intimate club shows in late November, with the bulk of the tour already sold out. Tickets for the available dates can be found via www.yourbaroness.com/tour. Baroness is John Dyer Baizley (guitar, vocals), Pete Adams (guitar, vocals), Nick Jost (bass, keyboards) and Sebastian Thomson (drums).